This pretty much sums up my feelings towards unfined beer and CAMRA. A well crafted and well looked after unfined beer adds a new dimension to the current beer market, and one that if done well I believe can improve the quality of beer being sold over the bar. It also echoes my sentiments towards CAMRA. I am not against CAMRA, but their unwillingness to change to a modern beer industry is becoming more evident, which makes them less and less significant to me. They also seem to have adopted an almost dictatorship when deciding what consumers want through the production methods they promote and the selection at their beer festivals*, rather than let their members choose for themselves. I believe that if their is a change within CAMRA, then it will take a generation of drinkers before this happens, so for the moment I choose to ignore. *Some local CAMRA branches to put on very good festivals, which I do enjoy attending. The more people try to define ‘Craft Beer’ the more I am getting annoyed. Should it be down to size, how many hops they use or, are they only craft if they produce a keg product? The problem is not within the question, it’s the answer that is wrong. the members of a skilled profession. (the Craft) the brotherhood of Freemasons. Obviously, when referring to the production of beer it is the first point that is relevent, a ‘skill in making something by hand’. It is easy to see how this will apply in brewing, but to me it ends up muddying the water more, and which is why I believe this is the wrong term to use. A ‘craft brewery/brewer’ would produce their beer by hand, which skill and knowledge. Nothing wrong with that, but it doesn’t do what it is supposed to. As an example, who would consider Greenfields Brewery a craft brewer? Well, not even themselves, they make ‘real ale’. But check out the ‘Brewing Process’ tab on their website. They brew on a basic Porter brewing kit, which I know from experience is a very ‘hands on’ brewkit. On the other side of the coin, take Thornbridge Brewery. I think most would happily consider Thornbridge a ‘craft brewer’, and they do have their smaller Hall brewery, but the bigger Riverside brewery uses the newest technology. With the computer systems they have greater control over the brewing process, in theory producing better beer. But is that ‘craft’? I wouldn’t say it is not, but it is obviously less so by definition than Greenfields Brewery. By using size as a way of definition is completely inappropriate, as with the two examples above Greenfields are obviously much smaller than Thornbridge. It would be possible to put an upper cap on size, but that mean every brewery that falls within the limits are a ‘craft brewer’? If so, then we are back to sqaure one. So what do I think is a craft brewer? Well again looking at the Oxford Dictionary I think they have it spot on. a beer with a distinctive flavour, produced and distributed in a particular region. Greenfields would fit this description, it would be very rare to find their beer outside of the local area, and as discussed they undeniable produce a ‘craft’ product. Thornbridge? Their beer is available both nationally and internationally. But it is brewers such as Thornbridge, such as Dark Star, such as Kernel, Camden, Magic Rock, Summer Wine etc that we are trying to define under the ‘craft beer’ banner, all with varying size and methods of brewing, which is why CRAFT IS CRAP. What they all have in common is an ethos, a desire to explore and create styles of beer, to use new or unusual ingredients,developed or introduced new methods to brewing and dispense, to produce high quality beer with the right ingredients first and price accordingly. They have brought a new style of brewing beer to Britain. They deserve to be championed as they are innovators in their field and I believe the future of British brewing. But they are no more ‘craft’ than anyone else. beers. 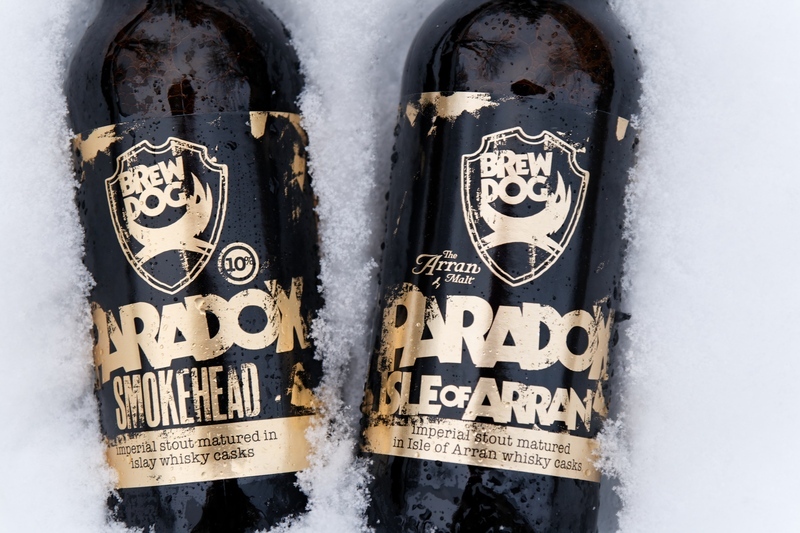 Brewers such as Brewdog and Hardknott have released some over the last couple of years, but I’d love to see it explored further. Yeast. Yeast is obviously a key ingredient in the brewing process, but one that I believe is under utilised as an ingredient to change the flavour of a beer. Many brewers use a single strain of yeast on every beer, or switch between a couple of different strains depending on the style of beer. I’d love to see someone release a series, similar to the single hop brews that many do, but focusing on yeast. By keeping the malts and hops the same for each brew and switching between yeast strains, I think it would be very interesting to see how each yeast changes the beer. Collaborations. I had the chance to try a couple of collaboration brews between UK brewers in 2011, but I’d like to see more. I think that bringing brewers together to create a beer often brings about something new and different. British Lagers. Again this is something that has started to happen, with brewers such as Thornbridge experimenting with different lager styles, but I’d like to see more of it. With the emerging craft keg market I hope and believe that there is an opportunity for British brewers to create some flavourful lagers that can go on to replace some of the mass produced stuff we currently have in almost every bar. How great would it be if you could travel around the country and know that you could find a draught lager brewed by a local brewery perminantly featured on bars? Awesome, I’d say. 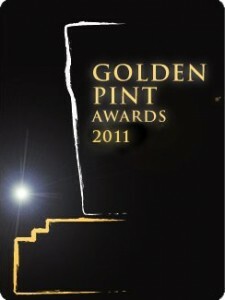 So thats a few of my ideas, what would you like to see from brewers in 2012? 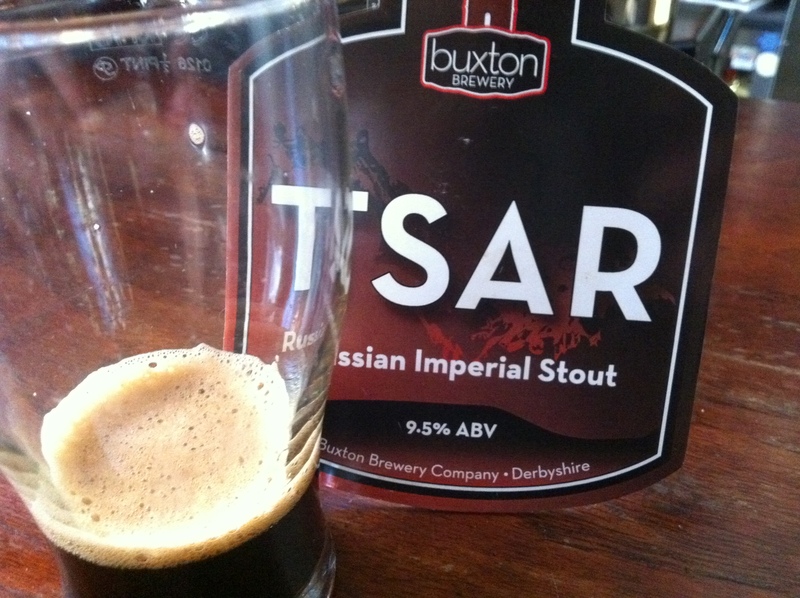 I’ve had Buxton Tsar in bottle a few times, and heard a rumour recently of a few casks floating about so set my mind to finding one somewhere. And recently, find one I did. Buxton are a brewery I have been very impressed with in 2011, from their session beers such as Moor Top to the IPA Axe Edge, each beer has been packed full of hop flavour but always remaining perfectly balanced. Tsar is their 9.5% Russian Imperial Stout and released around September time. I found my cask on a cold winters day, so grabbed a half and found a nice cosy corner to sit and appreciate it. The beer is jet black with a tan head. It gives aromas of bitter dark chocolate and a hint of coffee and a touch of alcohol burn on the nose. the initial taste is velvety smooth, chocolate and cream, leading to a bitter coffee and dark chocolate finish eventually giving way to more of the smooth chocolate flavour in the finish with just a touch of alcohol. The body is big as you would expect at this abv, with and almost syrup like quality in the way it clings to both the glass and you lips after every sip. It disguises its strength very well, but you still know you’re on a big beer. I love it. I really, really love it. But what would I rather drink, cask or bottle? Cask, every time. Although the flavours are obviously almost identical, the cask version seems to have a much bigger mouthfeel and depth of flavour. I highly recommend you try this beer, in either format you can find it, and anything else you see from Buxton Brewery. The big news in the alcohol industry on Thursday was that David Cameron came out in support of a minimum price per unit on alcohol of between 40p and 50p per unit. This is something that has been discussed widely over the past couple of years, with the Scottish government and local councils in Manchester and Liverpool already looking at introducing such schemes. The major complication seems to be legality under European competition laws, and that the government may face opposition from Brussels and possibly being challenged from those businesses it will affect. To quote the article in The Telegraph, we could expect the following price increases in supermarkets. I am, and have been for a long time, massively in favour of this. Although it wont really effect the price of an average 4-pack of beer, and certainly wont effect the cost of bottled ales and imported premium products in supermarkets, it will limit the discounts they will be able to offer. A 20 pack of 4% beer would have a minimum retail of just over £15, so the 3 cases for £20 style offers which are commonplace at key trading periods such as christmas and the easter will no longer exist. Although your average beer will still be around a third of the price in the supermarket than your average pub, my hope is that without these offers more people will be encouraged back to the pub. Hopefully, without the option of such cheap alcohol, consumers will decide that it is worth that bit more for the more social experience. The other group of retailers this will affect are the small market of pubs who run heavily discounted drinks promotions, such as £1 a pint nights. It is my belief that establishments with promotions such as these are what gives the pub industry a bad name. It encourages consumers to take advantage of the offer by drinking more, and anything that can be done to stop such irresponsible behaviour is a positive step in my opinion. A more sophisticated scheme would target cheap drink sold in supermarkets and shops, while not hitting those sold in pubs or more expensive alcoholic drinks. A well-placed source said: “The minimum price is really designed to push up the cheapest alcohol prices, which cause the most damage, rather than an across-the-board rise. The Prime Minister is very concerned about protecting traditional pubs. A couple of days ago I discussed whether a change of attitude in the way we discuss these issues was needed. Perhaps not. If the government have finally realised that increasing taxes is detrimental to responsable drinkers and retailers, not to mention the growing microbrewing industry, then hopefully they have begun to listen about where the problems truly lie in Britain’s ‘binge drinking’ culture. I only hope that the government can find a way around any issues with European law, and that they dismiss any lobbying from supermarket pressure groups. Oh, and that it doesn’t come with the rumoured increase in HSBD. So I may have only been blogging a few days, but Batman is a long time admirer of hops, malt, yeast and water (and anything else the brewer throws in there). Here are my highlights of 2011. Magic Rock Highwire. Fantastic on cask, better on keg. Marble Special 2011. Big tropical fruity hops, crisp and tart saisony goodness. Odell IPA. It might not be the most brash IPA on the market, but it is superbly well-balanced and extremely quaffable. For British brewers it has to be Magic Rock, overseas I’ll go for Brooklyn Black Ops. It has to be Magic Rock again. Every beer in their range is one of the best in its style. Tough choice, but I’m going to go for Stone Brewing. As I am involved in the industry I have an obvious bias, so I am going to change this to the pub/bar that has impressed me the most. I have only visited twice but Southampton Arms does it for me. Ale, Cider, Meat. ’nuff said. I buy very little from the supermarkets, but if I had to choose I’d say Marks and Spencer for their range of own branded beer. I bought beers from brewers I would usually bypass as a result. Another toughie, but I’m going to go for Ghostdrinker. Any one of about 8 could have won this. Zak Avery. Inspirational beer writing, humorous anecdotes on life. Brewdog. A good website, a generally entertaining blog, and an army of staff flooding your twitter timeline. Open Category: Batman’s ‘Beer Crusade’ of the Year Award. Summer Wine defending against their arch nemesis ‘Kevin’. I believe that supermarket pricing, coupled with the current economy, is undoubtably damaging the pub trade. More people are drinking at home because it is cheaper, but the part that interests me is that we, the small beer producers and retailers, along with the blogging community are inadvertently reinforcing the belief that supermarkets are cheaper than pubs. By pointing out and campaigning against the struggles pubs face in trying to encourage drinkers to support the pub, are we inadvertently promoting the cheaper option of the supermarket? Are campaigns such as the Save The Pub Group and initiative from CAMRA actually reinforcing the home drinker that they are making the right decision due to the industry being in decline? Is the almost constant reporting of pub closures over the past few years having a snowball effect? Do we need to change our attitude in the way we talk about the pub? If we were to focus on the positives and ignore the negatives would the national press also have a change in attitude, or stop reporting altogether? Whilst not all recent news, it is an even mix between positive and negative. So, is there a problem with how the pub and beer industry is reported? If so, how can we, the supporters of pubs put positivity back in to the British pub trade? I will be considering this over the next few days, and will post some further thoughts and would love to hear your comments. Finally, I have taken the step to blogging. I have wanted to do this for a while but struggled to find the time or the right angle to approach it. I will be blogging as ‘Batman’, but this will be a serious blog on my experiences within the beer industry and the beer I drink. There will be some batman references to keep the theme going, such if I am drinking in the ‘Bat Cave’ I am at home, ‘Wayne Enterprises’ will be the bar where I work etc. Anyway, I hope you enjoy reading, the first post will be along shortly. Batman is a Bar Manager, Homebrewer and Beer Lover. His blog will contain thoughts on the brewing and pub industry, the beers he is drinking, and everything in between and beyond. Are You Taking the Pith?